It’s a pretty regular thing for me to get emails about bread. After making 99% of my own breads, bagels and buns for the last 3 years, I think I’ve created a bit of niche for those interested in the joys of making bread. However, this email wasn’t about my bread, or a question about the bread making process. No, this email was an invitation from Silver Hills Bakery in British Columbia. What kind of invitation you ask; to sample their bread. I should say up front that I’ve eaten the occasional slice of Squirrelly bread for some time now, so it isn’t exactly new to me. In fact, as I’ve developed a wider and wider gamut of bread baking skills, I’ve often considered Squirrelly bread to be a goal for my own whole grain bread one day. So, it almost goes without saying that I was more than just a little excited to sample a few breads on the house. Nothing like free research! First off, we believe the simple things in life are best. Second, we live this belief with our breads and bagels by making them the way they should be: as simple, organic and delicious as possible, and made with sprouted organic grains in their purest form to provide the highest nutritional value for you and your family. With that strong vision it should come as no surprise to find the cost is relative. This bread is seems, is the grass fed, free range beef of the bread world. You might even have a bit of trouble finding Silver Hills bread, as their distribution isn’t anywhere near the scope of those over processed white breads that are so common. I’ve never had a problem finding the bread at Costc0, Safeway and Save-On in Edmonton, but I’d check the handy bread locator just to make sure your local store carries the product. With coupons in hand, I was off to the store in search of bread. After a few days, and a few stores, it became clear that you might not always find the entire selection. I think you should be able to track down Squirrelly, as it is one of the most popular organic breads around, but its counterparts may be hit or miss. I doubt this has anything to do with the taste or demand of their products, but more to do with the lack of preservatives. This is an area I can relate to, as I tell friends and family to consume my bread within a few days. I don’t really think that good bread should be lasting through the apocalypse. Sorry Adam Webber, no home made bread for you. Planet Organic seemed to have the largest selection, and it’s where I ended up buying my loaves. Squirrelly to start; it is the top seller after all and Sarah’s favourite go-to option when not eating my bread. 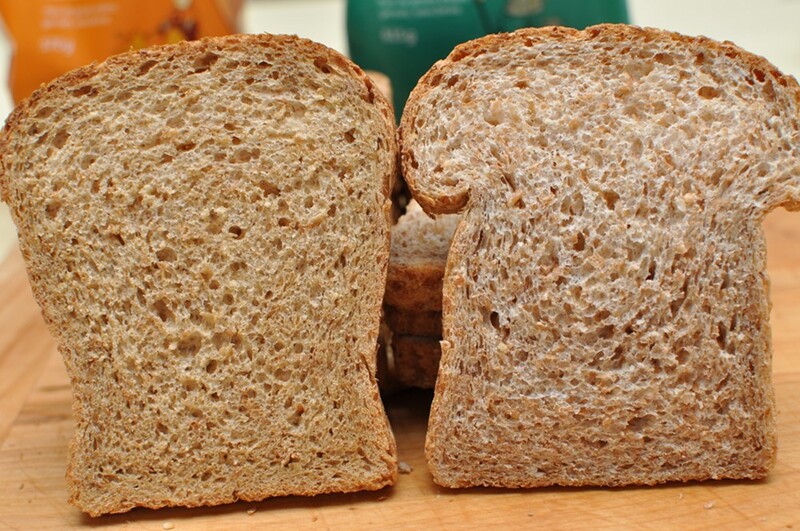 King’s Kamut; if for no reason than to see how the ancient kamut grain would translate into bread. Hardy Hearty Harvest; if the seeds in Squirrelly are good, then could more be better? Finally, Marvelous Multi; not just one sprouted grain, but a whole collection. Sarah and I did our due diligence with this sampling; eating a bit of each before repeating the process over and over until we were loaded with fiber and whole grains. The two distinct notes that were very obvious for us, the deliciousness that is Heart Hardy Harvest, and the bland taste of King’s Kamut. Right from the start, and no matter how hard we tried, the King’s Kamut could not compete. Don’t get me wrong, it had a great bread texture, and would be fantastic backdrop for a sandwich because as it would take on the condiments and toppings so well. We both agreed that Marvelous Multi, with it’s lack of seeds, could easily replace any 60%-plus whole grain bread. 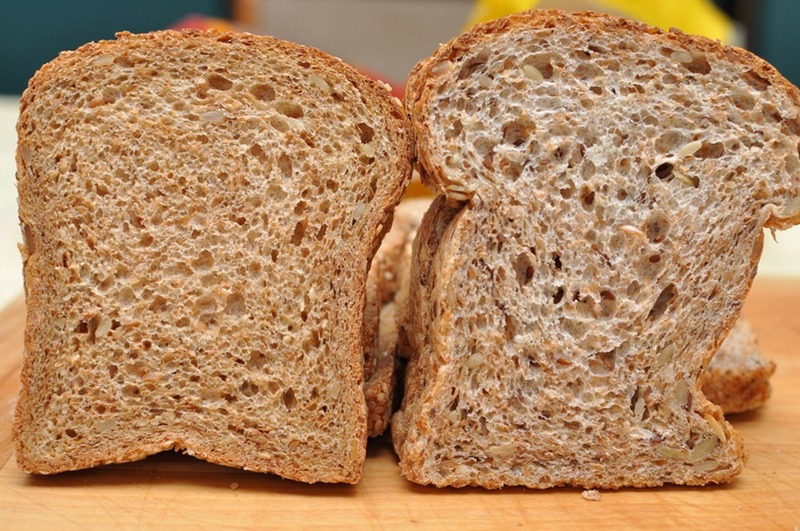 Soft and chewy, you aren’t about to be thrown off by any taste other than whole grain bread. Finally, Squirrelly. If it wasn’t for the amazing flavour that the Harvest loaf offered, this would have easily been number one. Giving slices of bread to a dump truck load of friends, family, and coworkers, I found the results surprising. The Hardy Hearty Harvest, which I thought would scare away people, took top spot in all but 4 or the 15 tests; easily making it the favourite. Squirrelly and Marvelous Multi were neck and neck for a bit, but Marvelous eventually bowed down to Squirrelly. And in no surprise, the King’s Kamut pulled into at 4th with most claiming it just didn’t do much when eaten with the other samples. This was one of the better taste tests I’ve been given the privilege of trying, and it was fun to see the comments from everyone. The whole sprouted wheat genre is something new to my baking, and with a few great examples of what to expect, I look forward to growing both sprouts and sourdough in my fridge. If you thought after reading this, there would be nothing for you, you were wrong. Extending the offer to more than just me, you are invited to fill out this quick survey (click here). By doing so, you are going to get yourself a free loaf, and have the opportunity to try it out for yourself. As well, there is a giveaway. Silver Hills Bakery has provided a t-shirt and 5 free loaves for me to give-a-way. So all I ask is that you describe your perfect sandwich. Maybe it’s just cheese whiz, or peanut butter and jam. Although I’m sure a few of you would like it loaded with dry cured meats and exotic cheese. Let me know, down the mayo of a detail, and I’ll randomly select the winner. *All sandwich descriptions should be in by 5PM MST next Saturday (July 3rd), and a winner will be randomly selected. Don’t forget to come back and see what kind of creations people come up with! Great review, Chris! Me thinks Wendy at Silver Hills is the best Marketing Manager they have had… I am seeing post about this all over the blogosphere, lately. I love your take on it. Should be fun to see! Thanks Valerie. I’m curious what your favourite sandwich is? That sounds like a fantastic creation! I’m a sucker for havarti. Thanks. I enjoyed this post a lot. I’m come across the Silver Hills bread a few times now and have been curious as to how they were. Thanks! – put together and enjoy! You are totally going to think that this is gross, but trust me, it is awesome. Trust me, soooooo good! Sweet and savory and nutty all in one delightful sandwich! Just found your site btw! Really a fun read! I don’t/can’t eat sandwiches – but, I remember my dad making me a roast beef sandwich with onions and mustard and just the right amount of salt and pepper. He would make this after the Sunday roast… and it was his favourite, and I loved it, too. Another, open faced tomato with salt and pepper and a little skim of butter…perfection. You don’t eat sandwiches Valerie! That roast beef sandwich must be a classic for many people, as I can remember the same thing. Sounds yummy!! So, my favourite sandwich is made with lightly toasted bread, spread with goat cheese, and then filled with grilled vegetables (zucchini, peppers, onions, tomatoes, etc.). Best sandwich of all times! Ah, my fav bread! I love using the Squirrelly to make a hummus (must be Sabra! ), French’s mustard, avacado, tomato and lettuce salad. Bacon on there would be pretty tasty too! hi there – love love love your blog! my sandwich is pretty boring compared to some but here goes. My favourite sandwich and daily sandwich is squirrely bread with cooked turkey, cucumber, tomato, sprouts, banana peppers and mustard. Simple and so good!! My favourite sandwich is easy: crispy bacon and a perfectly fried egg. YUM! chance of this happening? or have i missed them? I know that they make bagels Linda, but I wouldn’t be surprised to learn about buns if the demand is there. two to compliment one another.